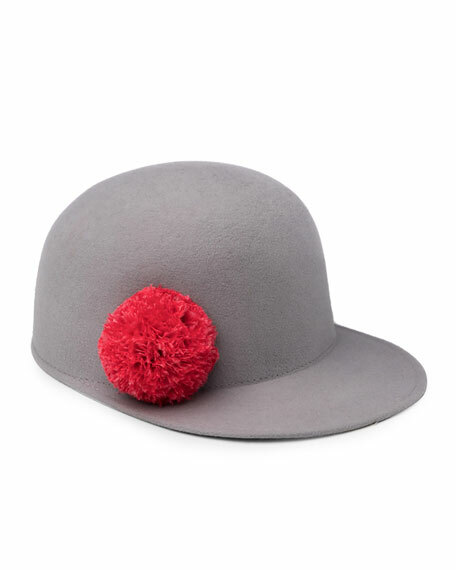 Eugenia Kim "Bo" baseball cap in wool felt. Contrast feather pompom at right. Eugenia Kim, who attended Parsons School of Design, launched her line in 1998 after a hat she had created to hide a bad haircut caught the attention of several SoHo storeowners. Her unique millinery creations, crafted from woven, felt, and straw materials, are trimmed with vintage ribbons and feathers. For in-store inquiries, use sku #2151109.